Bettie Sitolo is a 42 year old a widow who lives in Phalombe District. 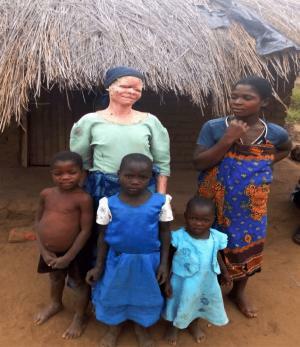 Bettie was born with albinism, a condition that does not allow her to work under the sun due to her susceptibility to extreme sunburn and skin cancer, and is also a condition that faces significant stigma in Malawian culture. Until one year ago, Bettie had no toilet and used to relieve herself in the bush far from her house. Defecating in the bush that was far from her house was particularly dangerous for Bettie, due to the recent spate of abductions and killings of albinos in Malawi for their bones, which has occurred in her home district of Phalombe. “I used to be scared whenever I was going in the bush at night to relieve myself as I could be attacked easily by those people who abduct and kill albinos,” narrated Bettie. “I was living in fear for my life whenever I start the journey to the bush and from the bush”. Bettie was discovered by a Community Based Organisation (CBO) who approached United Purpose to support her to construct a latrine. In order for the project to reach the most in-need populations, it provides extra support for persons considered vulnerable. The project provided cement and labour to build Bettie an Ecosan latrine, which would also support her family’s livelihood by substituting expensive fertiliser for human manure, which is a free by-product of the Ecosan latrine. “I did not hesitate to mobilise bricks, sand and quarry stone with my two daughters for the latrines, as I knew that after the latrine will be constructed it will be the end of the challenges I was facing,’’ narrated Bettie.